Where'd All The Cars Go? Pretty soon there won’t be any General Motors vehicles left on the roadways that haven’t been part of a 2014 recall. On Monday, the company announced the recall of 7.6 million vehicles in the United States – 8.4 million worldwide– most of them for the same inadvertent ignition key rotation that has been linked to at least three fatalities. In the first campaign, GM is recalling 6.8 million sedans because the ignition switch may inadvertently move out of the run position if the key is carrying extra weight and experiences a jarring event such as hitting a pothole or crossing railroad tracks. The second announced recall includes 554,328 model year 2003-2014 Cadillac CTS and model year 2004-2006 Cadillac SRX vehicles for the same unintended ignition rotation issue. The company says it is aware of seven crashes, eight injuries and three fatalities related to the new recalls. The three fatalities occurred in late-model full-sized sedans being recalled for inadvertent ignition key rotation. Consumers who drive the affected vehicles are asked to remove all items from their key ring until repairs can be performed. In early June, GM recalled 3.2 million vehicles for a related issue. There were no reported fatalities with those vehicles. While the issue sounds eerily similar to the massive ignition switch defect plaguing GM in recent months, the company says there is no conclusive evidence that the two issues are related. The latest ignition-related recalls comes just hours after the car manufacturer announced the details of a compensation plan for victims of the unrelated ignition switch defect that killed at least 13 people. •181,000 model year 2005-2007 Buick Rainier, Chevrolet TrailBlazer, GMC Envoy, Isuzu Ascender, Saab 9-7x vehicles, and the 2006 Chevrolet TrailBlazer EXT and GMC Envoy XL SUVs were recalled for a possible electrical short in the driver’s door module. The short could disable the power door lock and window switches and, in rare cases, overheat the module. •9,371 model year 2007-2011 Chevrolet Silverado HD, GMC Sierra HD trucks equipped with an auxiliary battery, because an overload in the feed may cause the under hood fusible link to melt. If that were to occur, smoke or flames could damage the electoral center cover or nearby wiring conduit. •2,990 model year 2011-2014 Chevrolet Cruze, model year 2012-2014 Chevrolet Sonic, 2013-2014 Chevrolet Trax, Buick Enclave and Verano vehicles because insulation on the engine block heater power cord may become damaged during very cold conditions. •106 model year 2014 Chevrolet Camera and Impala, Buick Regal and Cadillac XTS vehicles because some may not have had a “Superhold” joint fastener torqued to specification at the assembly plants. Officials with GM say the company will increase the amount it is setting aside to cover recall repairs to $2.5 billion in the first half of the year. 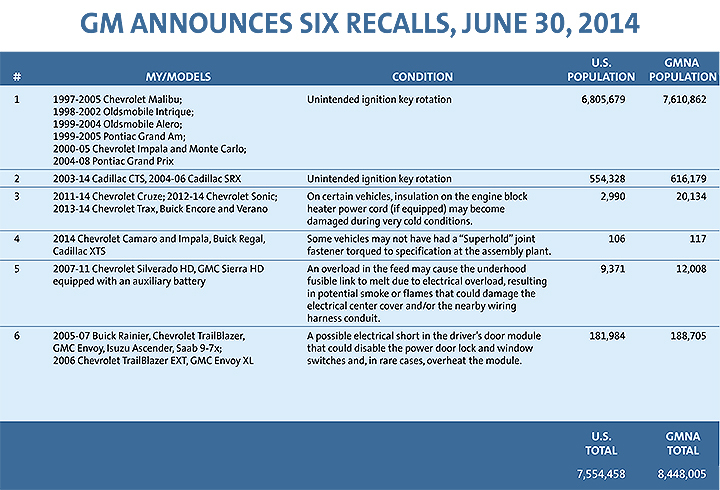 So far in 2014, GM has recalled nearly 25 million vehicles in the United States through more than 50 recall campaigns. A quick look at GM’s sales records for the past ten years, shows that the company has now officially recalled in the first six months of 2014 more cars that it has sold from 2007 to 2013.